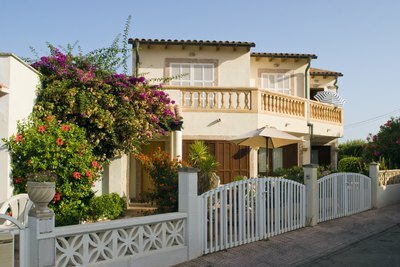 Popular in the West and Southwest, Mediterranean-style homes are characterized by stucco or plaster siding, red tile roofs, shutters and wrought iron accents. Whether your Mediterranean home is a sunny one-story rambler or a palatial Spanish revival mansion, choosing the right exterior colors can bring out architectural detail and complement your home's style. Greek lore has it that vibrant turquoise blue color wards off bad luck and evil spirits, writes tour guide and author Theresa Mitsopoulou. Sunny white plaster walls accented with bright blue doors, shutters and trim are a common sight in Greece. Paired with terracotta pots brimming with geraniums, this exterior color scheme evokes Greek island living. Warm, spicy colors evoke Morocco and Tunisia. The Paint Quality Institute's color trend forecast for 2010 anticipates homeowners will choose subtle hues with high-impact accent colors, whether they are personalizing their own homes or readying them for sale in a competitive market. If your Mediterranean home has substantial exterior wood trim and shutters or arched windows, accentuate it by pairing a honey-hued base color with chocolate brown, or sunwashed pink with deep green trim. Consider fixed architectural elements such as the roof, masonry, or decking and choose colors that make the most of them without clashing. Pale, bright colors don't have to look monochromatic or bland if you use complementary colors–those opposite on the color wheel. Try pale pink or yellow and sky blue, light terracotta siding (think of the color of faded clay flower pots) with white trim, or white siding paired with your red tile roof and light blue trim. Almost any color combination can evoke a Mediterranean look if the colors are warm and sunny. Even if neighborhood convention or your own taste preclude you from choosing vibrant Mediterranean colors, you can still introduce some punch to your home's color scheme. Consider your landscaping–if you live in a region with long summers, make the colors and textures of your garden the focal point, and paint your home in subtle, warm shades as a backdrop to hot pink bougainvillea, palm trees, pots of bright flowers and ornamental grasses. Echo these colors with a splash of brightness in awning fabric, or a jaunty red front door. Instead of painting wrought iron accents traditional glossy black, choose very deep plum or blue.